In 2017, wind power in the US accounted for more than 6% of all generated electrical energy. 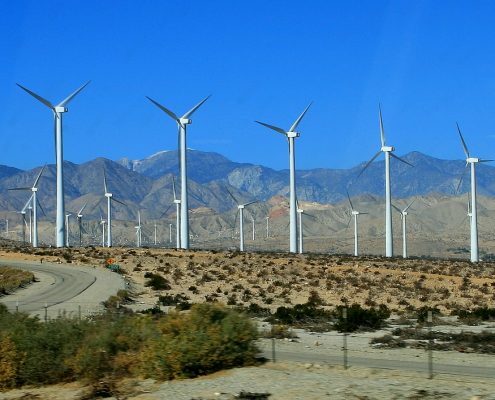 Fourteen states have 10% or more of their energy generation coming from wind power. Wind turbines in distributed applications are found in all 50 states, Puerto Rico, the US Virgin Islands, and Guam to provide energy locally, either serving on-site electricity needs or a local grid. Wind energy is a booming industry, with market increases projected to continue. To protect your investment in the future, you need wind turbine coating which protects against the erosion and corrosion of the structure due to the harsh environmental conditions it faces daily. They increase the wind turbine’s strength, lifespan, reliability, and durability as well as reducing the need for costly maintenance. Naturally, a wind turbine requires wind. They are most efficient where environmental conditions are the harshest. For example, the United States has very large offshore wind energy resources due to strong, consistent winds off the long U.S. coastline. Exposed to constant winds, heat, UV radiation, rain, or ice, wind turbines will quickly corrode and fail if not treated properly. 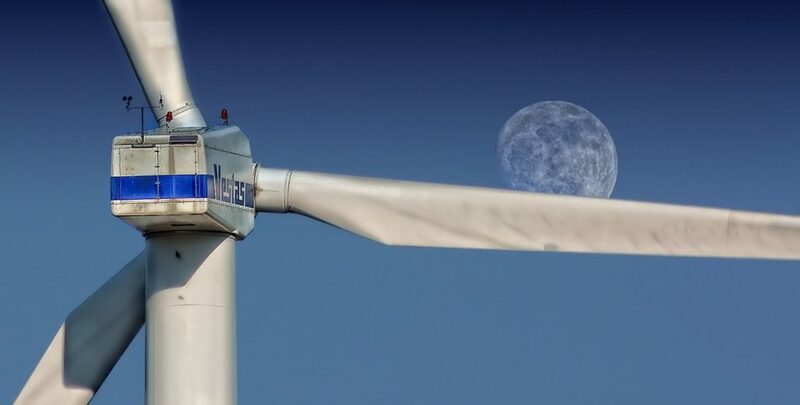 In this article we will provide you with a look into the benefits of high quality wind turbine coatings, the types of wind power coating as well as an overview of the manufacturers and products available in the USA. In the highly corrosive environments necessary for the most effective wind turbines, corrosion is a big problem. Sub-sea structures, splash zones, and the salt spray in the wind itself all present difficulties for the stability and strength of a wind turbine. The wind turbine coatings need to provide the highest degree of corrosion protection. The front edge of a wind turbine blade is subject to constant impact from airborne projectiles such as rain, ice, salt, or sand. The blade tip on a large turbine can can travel at up to 250 mph as it rotates, and pitting, delamination, and cosmetic failures form, compromising the blade’s integrity and developing into total blade failure. This ‘leading edge erosion’ is one of the biggest issues challenging wind turbine coatings. Damage from rain and sand can reduce a turbine’s energy output by 20% a year. A turbine may be in continuous operation for 15 years and the coatings need to provide around the clock protection. The scale and location of these structures makes maintenance and accessibility a highly expensive task. The best wind power coatings aim to be maintenance free for their lifetime. The Original Equipment Manufacturer (OEM) of wind turbines have a range of coating technologies and methods to choose from. Commonly used polymer coatings are epoxy, polyurethane, acrylic, and fluoropolymer. These coatings are applied either in a factory or in situ, depending on the relevant restrictions. Polymer coatings are chosen for their high performance properties: corrosion resistance, durability, chemical resistance, smooth finish, and toughness. Fluoropolymers have the added benefit of dirt resistance and to combat biofouling at the turbine base. Polymer coatings are commonly applied as layered systems, rather than single coats. In this way the different properties of the coatings can protect other layers as well as the turbine, strengthening the protective system. Recent developments in the wind turbine coating industry include paint systems requiring fewer layers in order to reduce production time and cost. A common 3-coat system will use epoxy as the base coats and polyurethane as the top coat, using polyurethane’s UV resistance to protect the less-resistant epoxy. A TYPICAL 3-COAT SYSTEM FOR WIND TURBINE TOWERS BY HEMPEL: Hempadur Avantguard (a two-component, zinc epoxy) as primer, Hempadur Mastic 4588W (a two-component, high build epoxy) as the intermediate coat, and Hempathane HS 55610 (a two-component polyurethane) as the top coat. 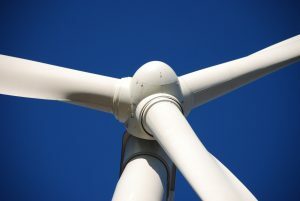 As well as zinc-rich epoxy coatings, wind turbines are often coated with metal coatings – non-ferrous metals such as zinc, aluminum, and its alloys. These metal coatings are applied through a variety of methods, including hot dip galvanising, electroplating, thermal spraying, and diffusion. Structural pieces undergo galvanising and spraying, where smaller pieces use electroplating, diffusion and galvanising. In particularly corrosive environments (C5-M zones such as marine, coastal or high salinity areas), a duplex system is often used to protect turbines. A duplex system is the combination of a metal coating base layer and a polymer paint system, commonly used for offshore wind turbines. Even if the polymer coating fails or is damaged, the structure is still protected by the metal coating through both galvanic and barrier action. The duplex system is considered the toughest for offshore conditions. AN EXAMPLE DUPLEX SYSTEM: The untreated steel is first coated with zinc through hot dip galvanising, then a two- or three-coat polymer coating system is applied on top. This may be two layers of epoxy formulations or a three layer system like the one outlined above. Protection of the structure of the wind turbine is vitally important, but the mechanisms also need protection from corrosion and from the wear of constant use. Rotating machinery such as bearings needs coating to increase their lifetime while decreasing maintenance costs. Ceramic coatings are inorganic coatings including aluminum oxide, aluminum titania, chromium oxide, and more. These coatings are hard, low friction, abrasion and wear resistant, anti-galling, corrosion resistant, heat resistant, and durable. Ceramic coatings are also finding applications with the blades of wind turbines. This is in part because ceramic coatings have a greater abrasion resistance than polymer coatings, an important factor in combating leading edge erosion and preventing the constant impact of projectiles from damaging the blade. This type of coating contributes to the overall quality of the blade and makes the unfinished blades easier to handle than a fibreglass surface. The in-mold coatings are usually epoxy or polyurethane based and the application is time and cost efficient. These coatings focus on protecting the lead edge from erosion and they are often epoxy or polyurethane based and follow the order of a regular 3 coat system (polyurethane is the top coat). Offshore wind resources are more abundant, stronger, and more consistent than their onshore counterparts. With the first offshore wind farm becoming operational in December 2016, and a new project approved for South Fork, Long Island, the offshore wind farm market is finally moving in the US. More offshore wind projects are anticipated in the near future, bringing with them the promise of new jobs and low-cost, carbon-free energy. The offshore wind turbines are subject to harsher weather conditions than the onshore turbines, and require extra protection from salt spray and marine biofouling. Offshore wind energy is a clean, domestic, renewable resource that can help the United States meet its critical energy, environmental, and economic challenges. When restrictions due to competing uses and environmentally sensitive areas are taken into consideration, offshore wind could supply the nation with 2,400 GW of capacity – more than double the combined generating capacity of all U.S. electric power plants. With a flourishing market, the wind turbine coating industry is also flourishing in America. Companies such as Thomas Industrial Coatings, International (AkzoNobel), Rope Partner, Hempel, and PPG all are specialized in wind turbine coatings. There are a vast range of wind turbine coatings available in the USA. It is important to consult with coatings experts when choosing any protective coating or coating system in order to ensure the best performance of both the coating and your asset. Note that especially for offshore structures, on-site repair work can cost up to 50 times more than the initial application cost. Below is a table outlining a few of the wind turbine coating products available. AkzoNobel Intershield 300 A two component, abrasion resistant aluminum-pigmented pure epoxy coating providing excellent long term anticorrosive protection for offshore structures. Hempel Hempadur Avantguard 750 A two-component, activated zinc epoxy primer for long-term protection of steel in severely corrosive environments. Jotun Jotamastic 87 A two component epoxy-mastic for repair and maintenance. Anticorrosive coating for a range of substrates. PPG Industries Selemix A polyurethane topcoat for turbine blades to protect from erosion. If you would like advice about wind turbine coatings, or are looking for a coating for your project, get in touch! Our experts are here to help. In cooperation with our coating partners, we will connect you with the coating solution for your needs.